Throughout the last decades, political parties have undergone deep transformations that are at once cause and consequence of the personalization of politics. As shown in the previous chapter, parties’ strategy of focusing increasingly on the image of their leaders — as a result of the changes undergone in both political communication and the electoral market — has affected dramatically the dynamics of partisan attachment at the individual level. Voters’ attitudes towards party leaders have indeed become a crucial driver of feelings of partisanship. Yet, the personalization of politics is supposed to have ignited an even more relevant change at the behavioral level. 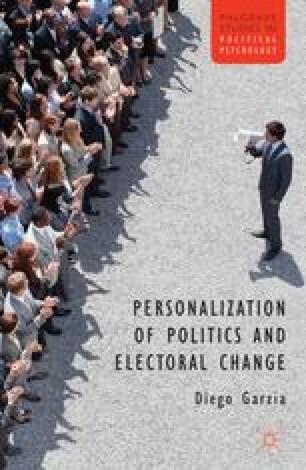 Indeed, one of the most crucial consequences of personalization lies — or, at least, should lie — in the increasing centrality of leaders’ personality in the individual voting calculus.